HEADSTONES Headline The 2015 ROCK 95 TOY DRIVE Concert Party Helping To Give A Kid A Christmas! 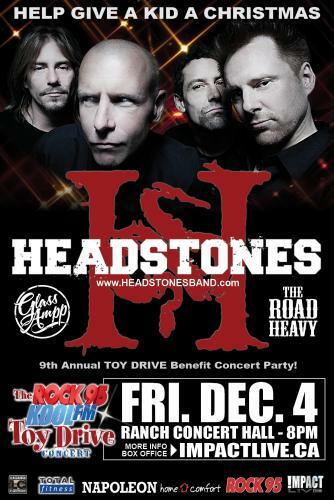 HEADSTONES Headline The 2015 ROCK 95 TOY DRIVE Concert Party Helping To Give Kids A Christmas! BARRIE, ONTARIO, October 20th, 2015 - IMPACT LIVE and Central Ontario Broadcasting announce The Rock95-Koolfm TOY DRIVE Concert featuring HEADSTONES with special guests Rock95 Local & Loud 2014 & 2015 Winners Glass Ampp & The Road Heavy Friday, December 4th, 2015 at THE RANCH CONCERT HALL, Downtown Barrie In Support of Helping to Give a Kid a Christmas this Holiday Season! BE THE COOLEST BOSS IN BARRIE and Book Your VIP Company Christmas Party at this event which includes a corporate donation to the Toy Drive & Great Publicity! If you would like to take advantage of this great team building opportunity, contact John Derlis from Impact Live directly! About The TOY DRIVE: Christmas is a time of giving, and what better way to give than to help a family in need enjoy a Christmas, and to put a toy under the tree for a child who wouldn't otherwise receive a toy on Christmas morning. For the past 25 years, Rock95 has presented its Christmas Toy Drive to help give children and families across our region a Christmas. Sister station 107.5 Kool FM has also joined the Toy Drive, and together with IMPACT LIVE hope to put smiles on even more kids faces this Holiday Season! CLICK HERE for full details on the 2015 Rock95-Koolfm TOY DRIVE! HEADSTONES - Canadian rock band, formed in Kingston, Ontario in 1987, began their early music career performing to anyone who would listen. At the time, artists such as Neil Young and Leonard Cohen were gracing the charts on Canadian radio while American musician Stevie Ray Vaughn was reviving the blues south of the border. Headstones decided to take a much different approach. Carrying a similar attitude to Iggy Pop and Henry Rollins, Hugh Dillon led members Trent Carr, Tim White and Dale Harrison into becoming a band synonymous with the real Canadian road-worn rock, touring their anti-social behaviour across the country to rough and restless fans. With nearly six years of touring, songwriting and growing infamy, they were signed to MCA Records (now Universal Music Group) in 1993. They quickly released Picture of Health through their new label, earning them platinum status on the Canadian charts. Their 2nd release, Teeth & Tissue, reached gold in 1995. Within a couple of years, the band had solidified itself as a commercial force in the music industry, dominating the charts and airwaves with hits off 1996’s gold-selling album Smile and Wave. Their achievements soon culminated, when the band received Juno Award nominations for Best Group and Best Rock Album that same year. Following this peak in their success, Headstones put out two other records, Nickels For Your Nightmares in 2000 and The Oracle of Hi-Fi in 2002. The band officially broke up one year later in 2003, still ranked as one of the most commercially successful Canadian rock bands. In 2010, Hugh Dillon received an unexpected phone call from a longtime friend and collaborator who had co-wrote “Cemetery”, one of the Headstones’ most popular songs. He was terminally ill, and would be leaving his young family in dire straits. Almost immediately, Dillon rushed to get the Headstones back together to play a benefit concert, which resulted in a handful of sold-out shows in Ontario. This experience allowed the Headstones to re-capture the spirit of camaraderie that originally drew them together. In 2011, the Headstones officially reunited for fans at Toronto’s Sound Academy. Storming the stage, the Headstones seamlessly picked up from where they left off ten years ago. Off stage, they began collaborating and writing new music. They entered the studio and recorded the track, “bin this way for years,” releasing it for free via their website. October 2012, they began crowd-funding through Pledge Music in the way of grass-roots self-promotion, as a way to directly engage their fans. Within a day, they had reached 100% of their goal; as of the album release, they had reached 295%. With this overwhelming response from fans, they too committed themselves to creating an authentic record true to their punk-rock roots. The band wrote a collection of hard-hitting new songs during their time in the studio, including #1 hit single ‘'Long Way To Neverland'.’ "Trent wrote the riff for 'Long Way To Neverland' and I had the lyrics down in 15 minutes. It came out so naturally," explained Dillon, "Every song on the album is different but equally as intense and equally as honest." Dillon brought in friend Chris Osti to co-produce the new collection with him at both Noble Street Studios and Imprint Music. The Headstones released Love + Fury worldwide, earning them a top 10 album for the first time in their career, and a 2014 JUNO Awards nomination for Best Rock Album of the year. After a successful run of Ontario shows at the end of 2013, it was time for the band to get back into the studio. In March 2014, they launched their second Pledge Music campaign, reaching 100% in only 12 hours, and 301% at the end of the project. This time, the Headstones would be looking back at their history, and reimagining some of their biggest hits, to give their ever-present fans a fresh new outlook on the band. After taking Love + Fury on the road to Western Canada, the band enjoyed the 2014 release of One In The Chamber Music. Their first vinyl release, featuring two brand new tracks, is currently in production, for a late 2015 release. ABOUT IMPACT LIVE: Established in 1985 as Impact Management Inc., TicketBreak’s Founder utilized his management company to administrate all concert & special event productions (viewable on www.impactlive.ca). Streamlining the companies name in 2010, “Impact Live” was launched. This fully turnkey special events company with unparalleled expertise and comprehensive range of live event services include: Event Management, Sponsor Fulfillment, Talent Booking, Production Services, Ticket Solutions, Venue Solutions, Integrated Promotion and Marketing. IMPACT LIVE has built a top reputation from over 25 years of long relationships with radio, record labels, venues, agents, artists, artist management, production companies, ticket agencies, municipalities, hoteliers, restaurants, limousine companies and concert goers. Everything needed from top to bottom IMPACT LIVE provides first class boutique service for your special event. Impact Live takes the time needed to meet your event goals and standards and are completely confident in the service they provide their clients and event goers. “Our business ethics and methodology have found a niche in the market place for clients that are looking for the complete service but at the same time want total choice, transparency and control of their financial streams. We believe relationships and integrity are keys to successful business. Great care is taken with our clients and vendors alike to ensure they are aware we value their business as our own” says Derlis.